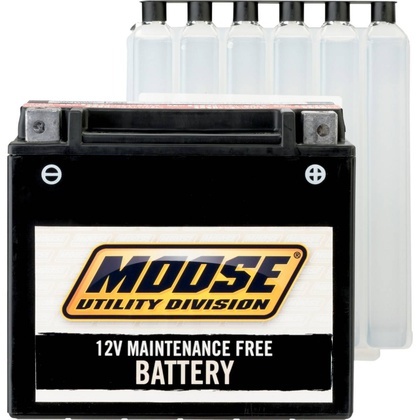 This Moose battery was simple to activate and install on my 03 TRX400EX. She's breathin fire now! Ready to hit the trails this weekend and test her out. Does this battery come with battery acid? Do I need to charge it before installing? Each Moose AGM absorbed glass mat battery comes with a pre-measured acid pack. All you need to do is peel back the protective cover on the battery and push that acid pack onto the top of the battery to fill it up. Once you've done that, seal the battery with the included press-on cover and apply the recommended charge to the battery. The included Moose battery instructions explain how to go about all of this. So long as you have the proper Moose battery charger, you're all set. Otherwise, if you need a battery charger, we recommend the Battery Tender Plus High Efficiency Charger. With that, you'll have everything you need to set up and charge your Moose AGM battery.